Took awhile. Involved more work than planned. Must have been a small reno. Yes indeed. Here are post one, post two and post three on the same small reno. Last step before the shelf was installed was repainting. Ended up repainting the kitchen walls and ceiling, the walls and ceiling where the stairs start to the basement, the hallway and the popcorn ceiling in the hallway. The paint job looks great, tied the line of sight walls into a unit, freshened everything. Monamel door and trim finish interir/exterior Eggshell (General Paints) pale grey. 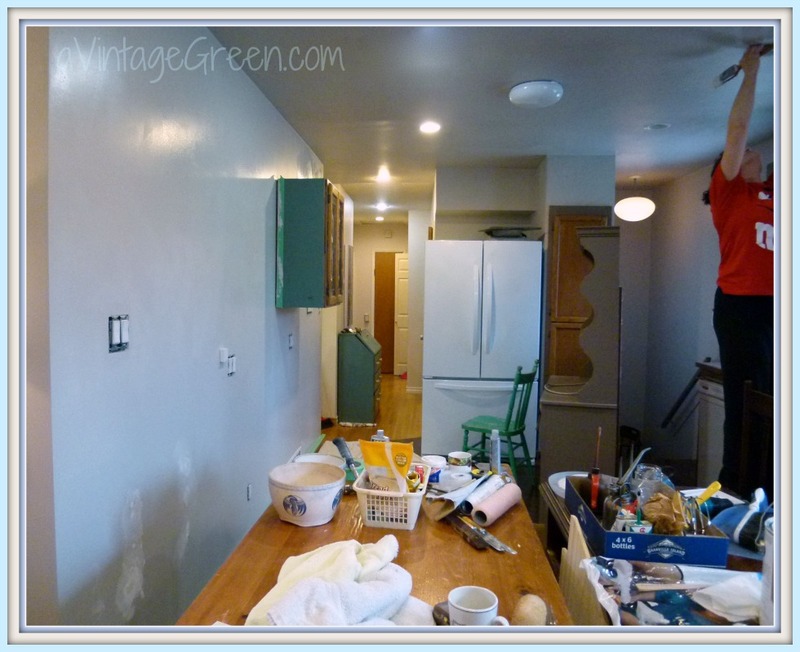 Two coats and any needed touch-ups on walls and ceilings. So, back to the small reno finish. 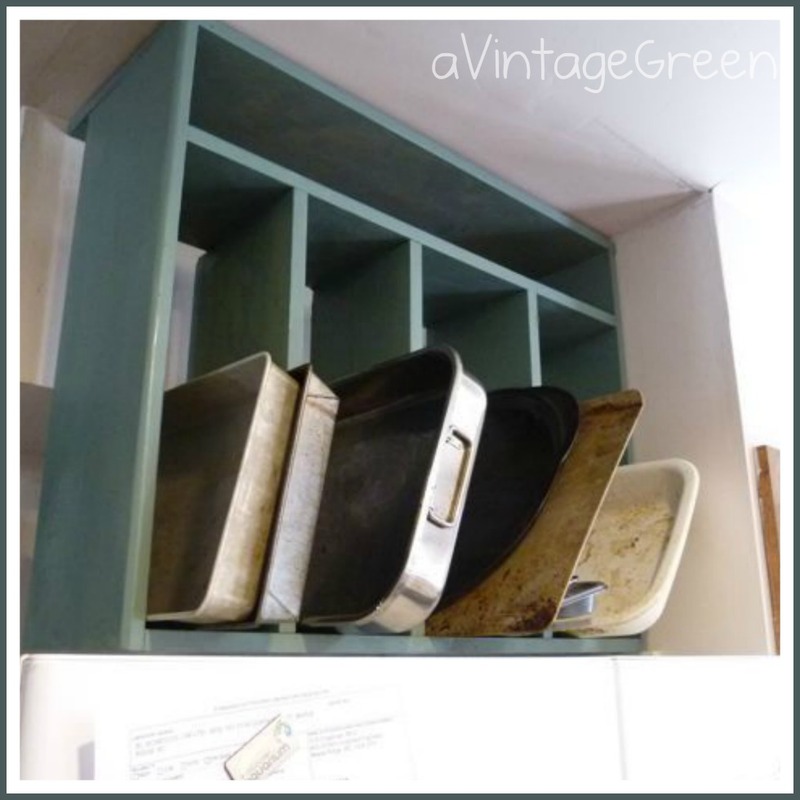 DH built a shelf unit to hold the large baking pans. He made it to go over the fridge. Normally the pans sit on top of the fridge but with the much taller fridge they were difficult to reach (short person writing). 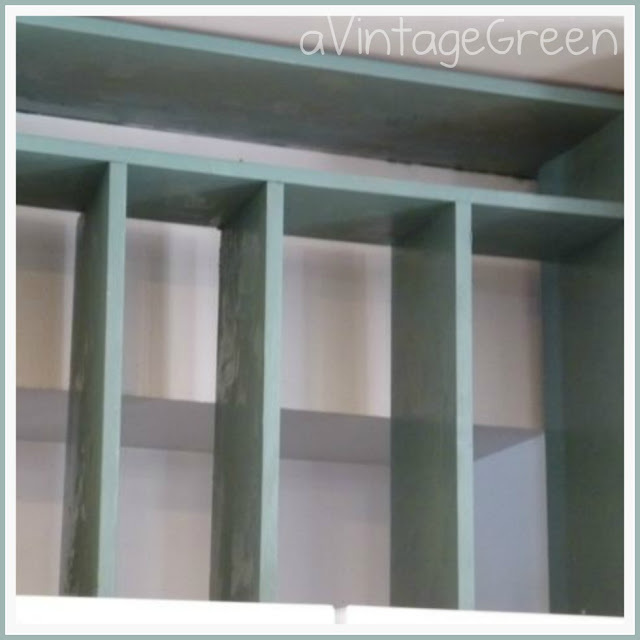 Used the same enamel heritage green paint that is found on various furniture/wall pieces in the kitchen. Last dabs in the litre (hope we can get a match up for the next tin General Paints Premium Alkyd English Pine PA 86050). Any cost to build the cabinet? No, used what was around, no new purchases. 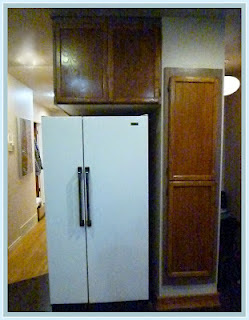 Small cabinet hung from the ceiling with supporting boards screwed into the wooden 2x4's (just like on TV shows where they show how to put up cabinets). Painted the supporting boards the same colour as the walls. You can see the rebuilt drywall section (look like a shadow under the text aVintageGreen in the photo below). That missing drywall was the start of all the extra work we had to do. Now, done. So, here is the before and after of the same wall. An amazing amount of work to get from before to after. 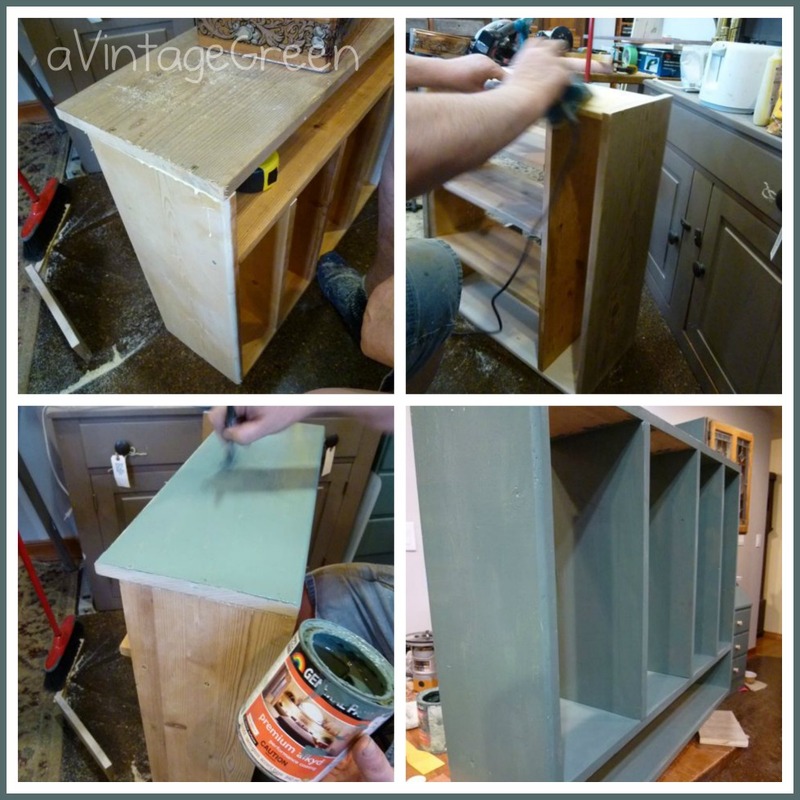 used scraps from other projects (drywall, boards, nails, glue, paint). 3 inexpensive rollers, some Polyclens, goo gone and paper towels. Wow! That was a lot of work. So glad you got it done. You gave me some great ideas! Looks great and the color is so pretty. Very handy hubby you have. Great work on that kitchen!! So nice when you can see the results of all your hard work! It's been fun watching your project, Joy! 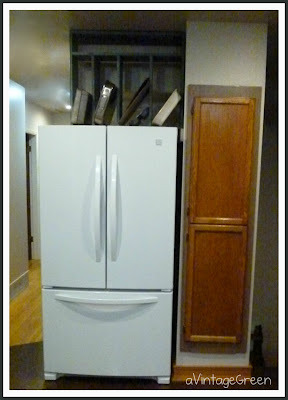 The new cabinet looks great and adds a charming touch to the kitchen! Looks great, Joy! Our projects always seem to go that way too--a good idea that seems simple becomes complicated and takes forever. In the end it was worth your time, though. 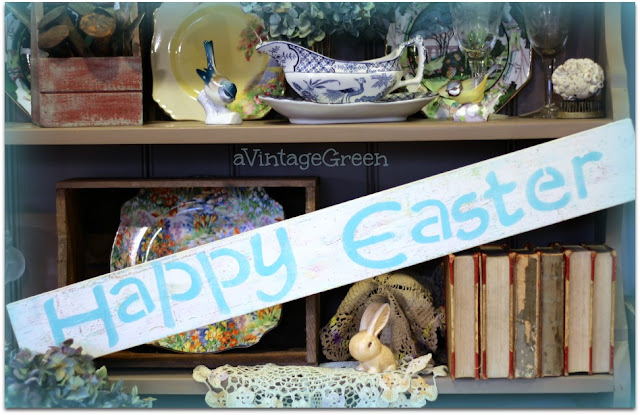 are you going to paint that long narrow broom closet door your "vintage" green? otherwise, love the look of it all!